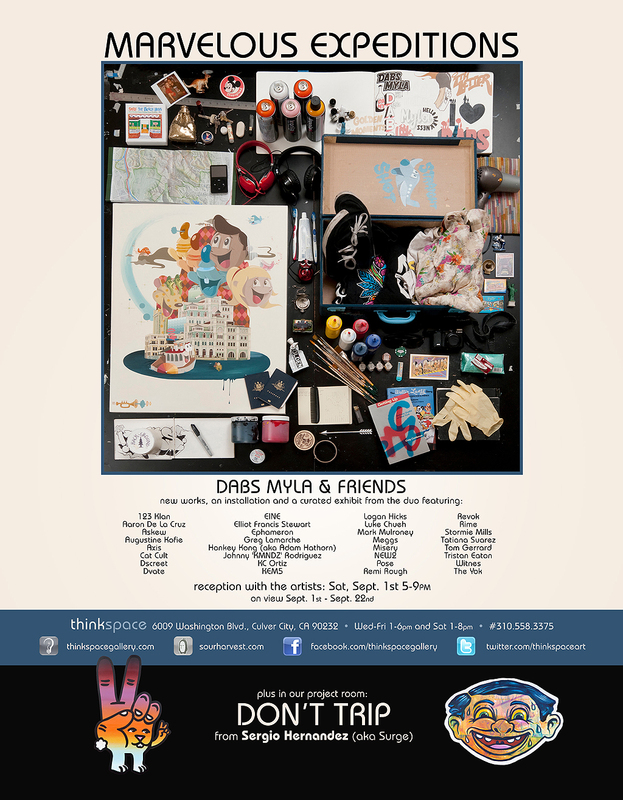 Thinkspace is pleased to present the highly anticipated Marvelous Expeditions by Dabs Myla and Friends. In the spirit of travel and all things wonderfully itinerant, acclaimed duo Dabs Myla will take over the gallery space and will feature new work and an installation alongside curated selections from 32 of their closest and most inspiring artist friends. The gallery will in effect become a locus of meeting and communal exchange, as artists from all over the world are brought together by Dabs Myla to share their experiences of traveling through its landscapes. Dabs Myla’s meticulously executed work combines narrative illustration, photorealistic drawing, and architectural rendering with a playful bawdiness and irreverence. Cast frequently as themselves in their imagery and host of characters, the artist pair create worlds of contentious and playful encounters against the seductive chaos of the urbanscape. The city features prominently in their work as the stomping ground for their numerous adventures. When looking at their pieces one has the impression of aesthetic confluence and fluidity, of two minds toiling together as one. The viewing experience is the keen pleasure of looking into another world and enjoying a story, and just as it is with the unrelenting freneticism of the city, there is always a new discovery to punctuate every observation right around every corner – and we’d be remiss to exclude mention of the donuts and street meat. As artists and urban enthusiasts Dabs Myla translate their experience of the world through a distinctly collaborative amalgamation of their styles and rendering strengths. Their work conveys a synchronicity of vision and aesthetic uncommonly allied and collusive. 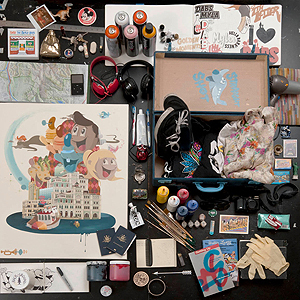 It is constituted by their shared love of travel, food, graffiti, illustration, and urbanity. Just as all productive chaos emerges from unlikely places, the momentum of travel fosters unexpected discoveries and collisions of worlds. Dabs and Myla, originally from Melbourne Australia and now currently based in LA, are no strangers to this productive geographic disruption, and this project seeks to celebrate the unexpected encounters and inspirations catalyzed by travel. They have invited each of their featured friends to produce a piece for the exhibition on a 16” x 20” wood panel, and with these set material parameters each artist will work their magic. The series is loosely meant to invoke exploration and travel, and each participating artist will metabolize their impressions of the theme differently through their respective styles, voices, and memories. Marvelous Expeditions showcases the duo’s love of friends, collegiality, exchange, and the proliferation of vision and variety that thrives alongside constant movement and displacement. These are the exploratory impulses of travel that lead to constant revisions, reconstitutions, influences, and to the indelible encounters that change everything.